Connecticut based Electronic Music Laboratories (EML) was most known for producing synthesizers along the same lines of Moog and ARP, but most EMLs were destined for the educational market. 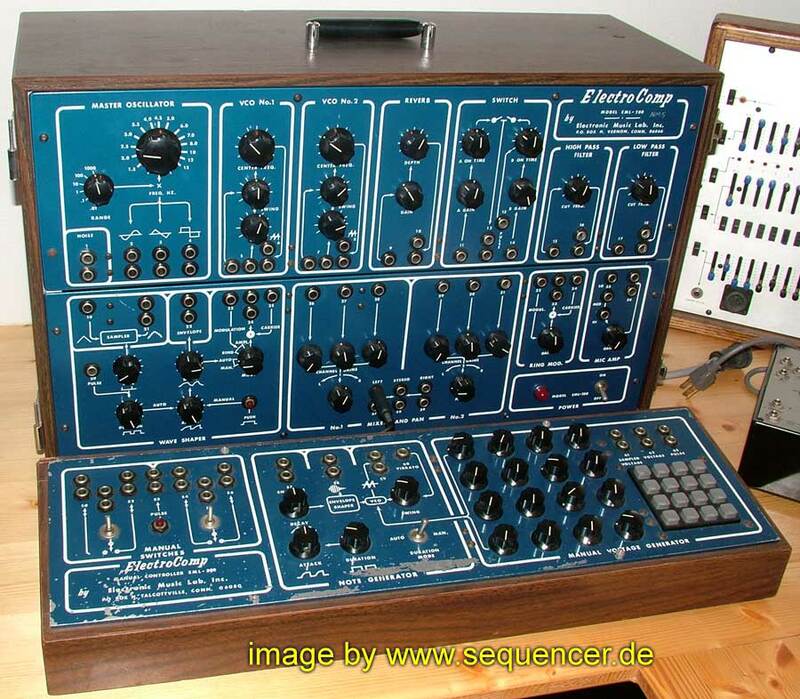 The ElectroComp 200 was one of EML's first synthesizers, introduced in 1969. It's old school but has very sophisticated features for the time (such as a Wave Shaper and stereo sound). It is monophonic and includes two oscillators, independent high- and low-pass filters, two ring modulators, an LFO with sample-and-hold, stereo panning, and built-in spring reverb. The front panel of the 200 is nicely designed and laid out (they can be found in either silver or blue, as seen here). There are 31 mad-scientist-looking knobs and over 60 patch points! With a little patching, even people new to analog synths will be able to start getting sounds out of the 200—it was originally intended for use in educational institutions. Note however that the EML 200 is keyboard-less, making it more like an Expander module designed to interface directly with other EML equipment. Most notably, with the Model 300 manual controller which offered a 4x4 key matrix, pitch knobs, and an oscillator with envelope generator and VCA of its own. Today, you can use the 200 with analog synths other than EML with the properly modified CV/Gate connections and converters (its oscillators are a non-standard 1.20v/oct). The EML 200 today is most valuable as a collectors item rather than a piece of studio kit, due mostly in part to its rarity in relation to the more popular Moog and ARP instruments that it is comparable to, as well as being surpassed by the more common ElectroComp 101.